Great Wall of Words Game Review - Download and Play Free Version! Link letters to form words and rebuild the Great Wall of China! Challenging and thought provoking spelling game. Interesting storyline gives you something to play for. Multiple modes and mini-games help the game from getting too tedious. Quest mode does not incorporate mini-games. Sounds can be over-the-top and obnoxious. For more than 1000 years the Great Wall has protected China from its enemies. But now a new threat has emerged. 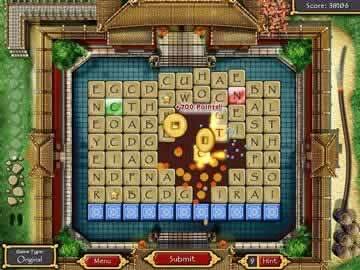 Embark on an epic journey of word building to repair the wall section by section and save China. 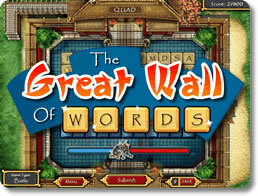 The Great Wall of Words offers 3 game modes, a story, and addictive fun. A very solid word game that deserves a play! You are an architect that must strengthen and reinforce China's only line of defense, The Great Wall, in order to stop the abrasive Mongol attack. Through spelling and creating words from adjacent letters you restore the wall as quickly as possible, improving China's defense. Wall of Words is a challenging and thought provoking game that will engage you with its theme and interesting storyline. Help China today by staving off the relentless Mongol attack. Wall of Words is a typical spelling game in the word genre. In this game you must create words by linking adjacent letter tiles together. Once a word is created you click submit and are rewarded points based on the size of the word, the rarity of the letters used, and the number of special tiles incorporated. Special tiles vary in color and value accordingly. Ruby is a 4x multiplier, Sapphire is a 3x multiplier, and Emerald doubles the value of the word you submit. Also, wildcard tiles, which are stars, can be used with any letter combination or word. These are great devices for drastically extending the length and value of your words. Bomb tiles also help boost your score and clear lots of tiles at once, helping you finish levels quicker. To detonate a bomb, you must make words using any of the 8 tiles surrounding the bomb. After three words are made with these neighboring tiles, the bomb detonates and you are one giant step closer to finishing the level. Wall of Words has two basic modes of game play: Quest and Quickplay. The Quest is the adventure mode in which you restore the Great Wall to prevent the Mongols from attacking. This mode is pretty simple and all the features and objectives for this mode are explained above. Quickplay, the second of playing options, incorporates 4 small mini-games. These games are Classic, Battle, Conquest, and Words Search. The Classic mode is the same style of play as in Quest, however the storyline is not present. In this you play against the clock. Battle mode has you spelling words to directly push back the Mongol attack. Through spelling large words quickly, you increase your strength and ability to fend off the attack. Conquest mode is a Capture-the-Wall game that has you spelling and capturing as quickly as you can. Finally, Word Search is a find the given words game. This is harder than a typical search because you will have to strategically spell words and eliminate tiles to be able to connect the unknown and special word. This is the most difficult of modes, even though the gameplay and objectives are very similar between all of them. As far as sound and graphics are concerned this game is par. The graphics are pretty good, but the sound effects and music can be overbearing and annoying. They detract from the game, which is a negative that can be fixed by muting them. Also, the mini-games don't add a lot to the game. They are essentially the same game with slightly different objectives. More variation with these games would be a huge bonus. Overall, Wall of Words is a good, but not great, word game. The storyline is engaging, however the gameplay isn't cutting-edge or new. It's essentially your typical word game with a couple quickplay mini-games. Enhancing the sound quality or adding new features would make this game much better and enjoyable to play. 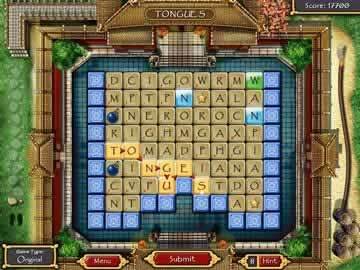 Fans of word games will enjoy this, however it is not something that new or cutting-edge. Give it a shot if you enjoy the letter chaining, word forming games. This game may be too advanced for younger players because of its spelling nature.